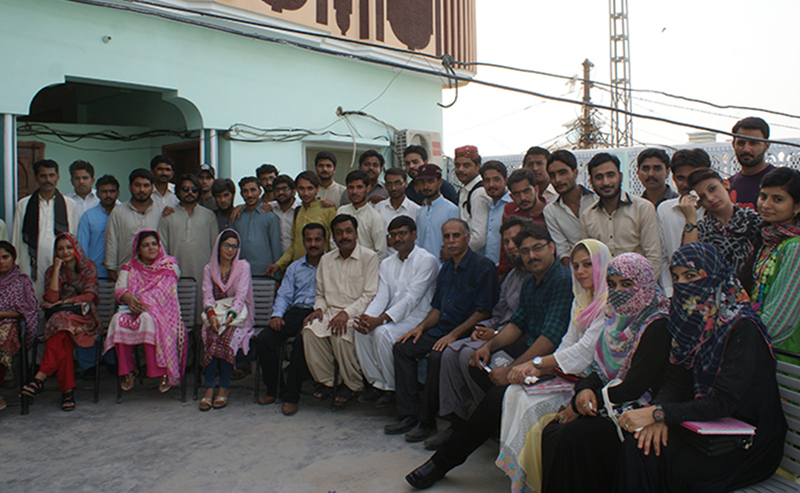 A group photo of Community World Service Asia Jhuddo staff with the delegation of Sindh Agricultural University. Ashar Nasir, Project manager, sharing organizational profile and how to develop and implement a project. 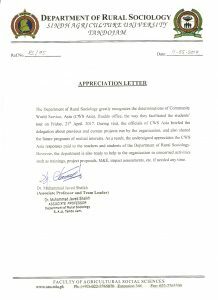 Appreciation Letter presented by the Department of Rural Sociology, Sindh Agriculture University, to Community World Service Asia, Jhuddo Office. The participants were given orientation on how to develop and function a Community Based Organization. 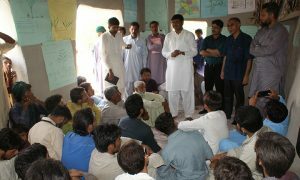 Dr. Ghulam Mujtba sharing his experiences with the members of the community in Fazal Wadho village. 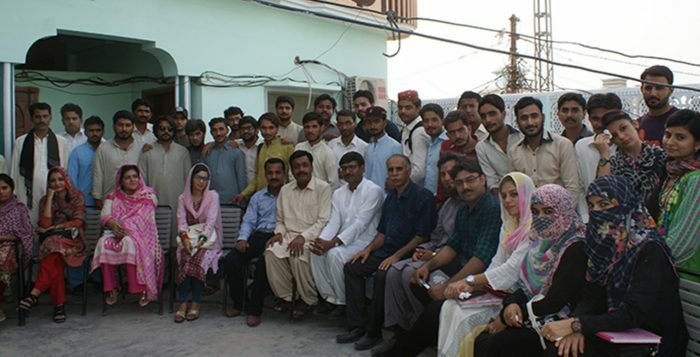 A group photo of university professors with the community of Fazal Wadho village. 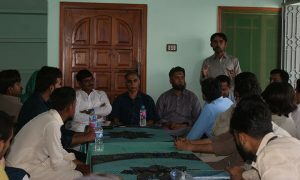 The delegation from Sindh Agriculture University and the community members were given an orientation session at Fazal Wadho village. 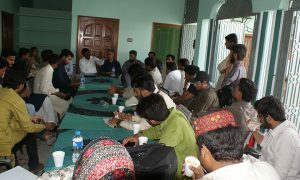 Dr. Muhammad Javed Shaikh, Assistant Professor, briefed the student regarding the purpose of the visit. Community extension worker sharing his experience of social mobilization and its processes at grass root level. 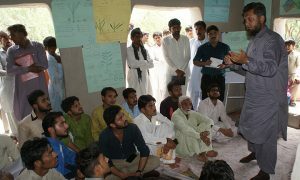 A group of 37 students of the Rural Sociology Department, Sindh Univeristy, accompanied by senior professors and chairman of the Rural Sociology Department (RSD), visited Community World Service Asia’s Jhuddo Office this April. The purpose of the study tour was to orient students on the working methodologies and policies of humanitarian organizations and NGOs’ and the role and structure of Community Based Organizations (CBO). Something different from the usual theoretical classroom learnings at the RSD, this exposure tour was designed to familiarize students with the different cultures and living patterns of rural communities and provide them with a practical learning experience. Ashar Nasir, Project Manager at Community World Service Asia, along with other staff, welcomed the group of students and faculty members at the local office. An introductory session, on the organization and its various projects and thematic areas, kick-started the exposure visit for the eager guests. 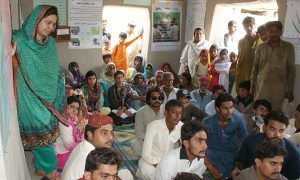 The group first visited Fazal Wadho village; one of the targeted villages of Community World Service Asia’s Promoting Sustainable Agriculture project in Badin. Participants were welcomed by members of the Community Based Organization (CBO). Mohammad Hassan, community representative of Fazal Wadho village, gave a detailed presentation on the village profile and its’ previous and existing initiatives with different organizations. He also briefed the participants on the history of the CBO’s formation, its objectives and their role in local development. This was followed by a question and answer sessions in which a student asked about the importance of CBOs at a community level. To his response, it was shared that CBOs bridge communication and networking gaps between feudal lords and higher officials and the local community people. The CBOs also amplify the voices of the village people on local issues and together with concerned departments develop resolutions to those issues. Community World Service Asia’s role, through their various Food Security and Livelihoods projects in the area, in forming the CBOs and VOs and equipping them with necessary resources and knowledge, was highlighted. The students and their faculty were told about the role the women of the community are playing in being trained on Nutrition and Kitchen Gardening to develop balanced nutritious diets for their families and themselves through the Sustainable Farming project in Badin. Many other field experiences were shared with the group, including the exposure visit to Sindh Agricultural University where the women project participants actively observed the workings of different departments. They also shared their experience of participating in the Farmers Festival which displayed their home grown vegetables on sale stalls and connected them with local retailers. Dr. Ghulam Mujtaba Khushk, chairman of RSD, appreciated the efforts of the CBO in local development. 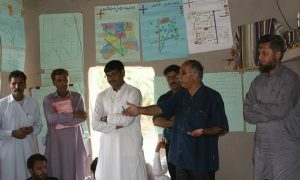 He appreciated the informative and effective opportunity given to the students and the faculty members; increasing their knowledge and learning in relation to the different practicalities of rural life and how people of various local communities are being involved to build a sustainable livelihood together. The students and faculty members learnt about project implementation, project planning and social mobilization. Concluding the visit, Dr. Ghulam Mujtaba presented an appreciation letter and a shield to Community World Service Asia Team for their commitment and contribution to the communities.